Ever had one of those life changing moments when you hear a song and nothing in the same ever again? Well Zach Williams- writer of the smash hit “Chain Breaker”- sure did, as he heard Big Daddy Weave’s song “Redeemed” on the radio after coming back home from a rock concert with his mainstream band. You can read more about Zach’s testimony right here, however the long and short of it was that Big Daddy Weave was a major help in where Zach is today as he ministers to every person and shares the gospel through song- the most recent release being an EP recorded live in prison worship services. Fast forward to now, and everything has come full circle. Zach wrote a song called “Alive” sometime last year when he was touring with…none other than Big Daddy Weave. He played the demo track back to Mike Weaver, lead singer of the band, and now here we are. With Big Daddy Weave’s brand new single- “Alive”, written by Zach Williams. It’s a cover, and generally most of the time artists are highly criticised by fans and professional writers if they promote covers as singles (case in point is Chris Tomlin with “Is He Worthy?” originally by Andrew Peterson!) Yet the end result of “Alive” is nothing short of extraordinary, as the band have unveiled their most vulnerable single since “My Story” four years ago, and their most compelling single since “Audience Of One”, “Everytime I Breathe” and “Overwhelmed” in my opinion. Radio friendly in nature (obviously! ), “Alive” clocks in at just under 3 and a half minutes, however packs a punch emotionally and lyrically. With Mike fervently proclaiming that Jesus has saved us thus now we are alive, we are met with an anthem to declare whenever we find ourselves falling for the lies of the enemy. We can, with authority in Jesus, proclaim that ‘…now I’m breathing in, I’m breathing out, I was in the grave, but God You called me out…’; and we can say with confidence that because of what we done on the cross over 2000 years ago, and because of the resurrection, we are now alive in Jesus. A nitpick of mine would be that this single may have held more meaning had it been released on Good Friday this year… but it’s a small nitpick. 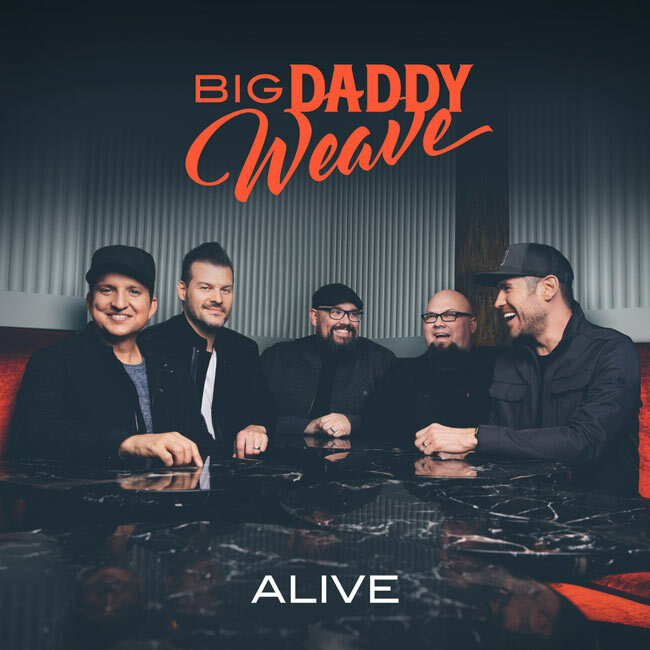 As “Alive” is so, so inspiring and crazily catchy, that Big Daddy Weave’s unnamed album to be released later on this year is now my second most anticipated album this year (behind Newsboys’ United, releasing in May)! “…as the Lord used ‘Redeemed’ to touch Zach’s life, He is now using a song that Zach wrote, that so deeply speaks to where we are. This song came in its perfect timing, with us coming out of a hard life season and into a season of light. We cannot wait for everyone to hear a song that means so much to us as a band…” What more can I say about Big Daddy Weave’s “Alive” that I haven’t said already? I’ve already showered this single with plenty of praise maybe a bit more than necessary, so I’ll just say this. Go listen to the song, and watch the music video! You definitely won’t regret it, as it’s one of my favourite songs of the year, alongside “Greatness Of Our God” from Newsboys (even though the year’s still young!). Well done guys, I can’t wait to hear your next album later on in 2019, and to see the effects of lives changed by “Alive” as well!